Onion Pakoda is a mouthwatering crispy & tasty Indian snack. It is made with besan, onion, chilli powder and rice flour. 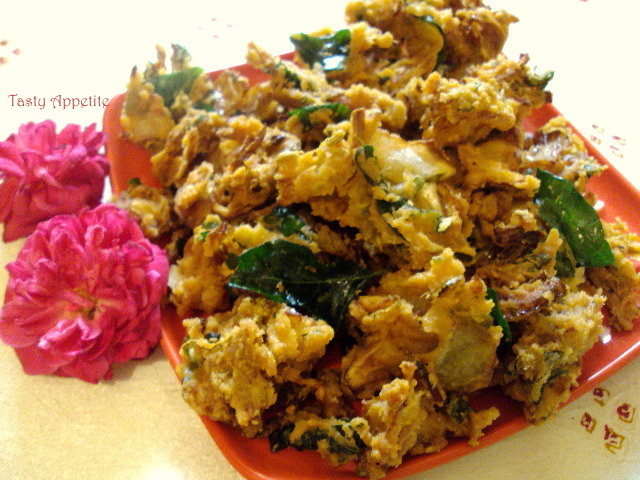 This crunchy Pakoda is an all time favorite for children. And it tastes heavenly with a hot cup of tea in Cold evenings. Also this can be used as a starter snack in parties and get togethers. This Pakora can be stored upto 2 to 3 days in an air tight container. Here is the easy and delicious onion pakoda recipe for you to try today..! Chop onion to thin slices. Take a bowl, add onion slices , salt, chopped curry & coriander leaves, green chillies, red chilly pwd, besan flour, ghee and rice flour. Sprinkle very little water and mix thoroughly. Leave it aside for 5 mins. Take a small portion of the mixture and drop it in hot oil by spreading to small batches. Deep fry till the fritters turns golden brown n crisp . Drain it in kitchen tissue . Onion pakoda looks delicious Jaya. One of my favorite evening time snack... Yummy! I am imagining onion pakoras and hot tea. 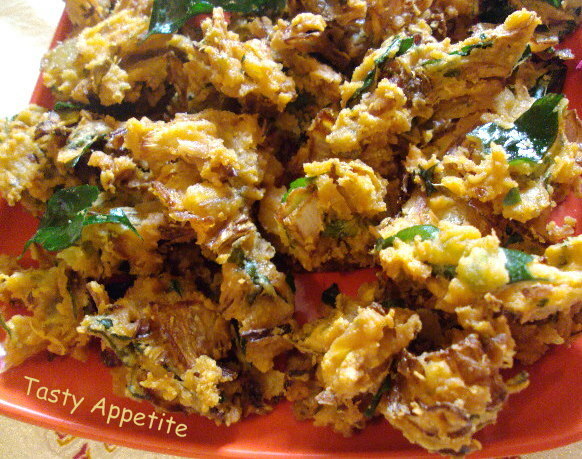 Lovely pakoras. Congrats for the award and wish u many more !! Onion pakoda looks yummy and tempting !! Crispy and yummy tea time snack,this looks superb. Feel like munching some,tempting crispies..
Oh god today its raining here at this time if i would have some it would be amazing with tea. Lovely. crispy and crunchy pakodas. Jay I love all you snack recipes! I've made several....keep them coming I would love to experience more! The pakodas look so crispy and crunchy.I would have tried this right away if it weren't for a sick daughter who is a big fan of this.I have bookmarked this so I can make this when she has her appetite back.Congrats on your award.Wishing you many more.And also a very big thank you for passing the award to me. Awesome looking pakoda's. I love them any time of the day. Onion pakoras looks yummy....even i love them with tea on a chilly evening!! 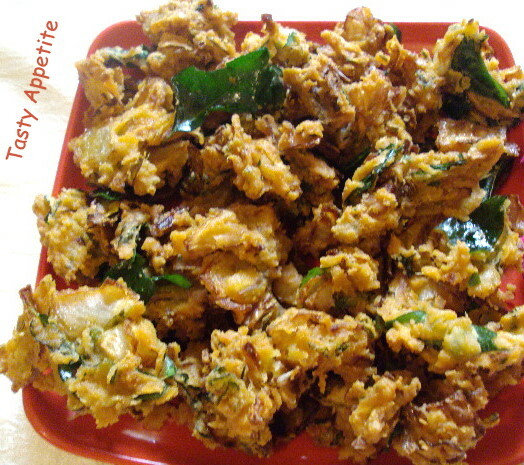 Wowwwwwwww.. my fav pakoda.. looks simply awesome and perfect !! Hi Jay, Congratulations on your well-deserved award. And thank you for passing it on to me, I really appreciate it! I was looking at my cookbook last night and came across "Onion Pakora" which I thought of making over the weekend! It looks really good and I know that my family would love this! Thank you for sharing your version! Favourite tea time munchees..looks very crispy. This snack looks so crunchy and yummy! i'd love to have a bite! Lovely pakodas to have anytime. Congrats on your award and thanks for passing it on to me. Congrats on award and these pakoras are anytime fav eve snack! பகோடா நல்லா மொறுமொறுன்னு சூப்பரா இருக்கு,விருதினை எனக்கும் பகிர்ந்தமைக்கு மிக்க நன்றி ஜெய்.உங்களுக்கும் வாழ்த்துக்கள்!! this looks like a very good snack and very crunchy too! Wow! !Jay, I have passed an award to you in my blog... :)Congrats. it is one of my favorites too. But i am only worried about the oil. If only I had some of these beautiful treats right now. I love to have some! What a great treat. ongrats on your award. Very inviting pakodas! will try soon!